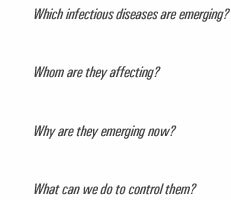 The International Conference on Emerging Infectious Diseases was first convened in 1998; ICEID 2008 marked its sixth occurence. The conference brought together public health professionals to encourage the exchange of scientific and public health information on global emerging infectious disease issues. The program included plenary and panel sessions with invited speakers as well as oral and poster presentations on emerging infections. Major topics included were current work on surveillance, epidemiology, research, communication and training, bioterrorism, and preventions and control of emerging infectious diseases, both in the United States and abroad.